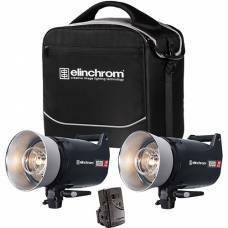 Conveniently lightweight and portable, Elinchrom strobe lighting is ideal for the professional studio environment. Elinchrom monolights and flash heads have fast recycling times that streamline your workflow and are particularly useful for slowing down action. Provides a short flash duration and fast recycling time ideal for people with busy schedules. Provides short flash duration and fast recycling time, the best choice for anyone starting a business. 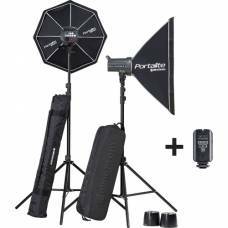 With its exceptional portability and uncompromising quality, work suddenly becomes play with this kit. 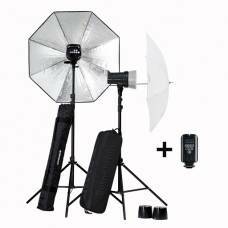 Ideal for experimenting with creative light and shooting portraiture on-location. 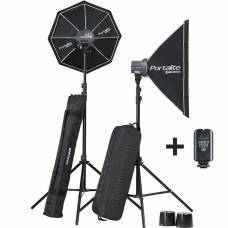 A powerful core on-location lighting kit for photographers working in the studio or on the road. This is the kit to start with. 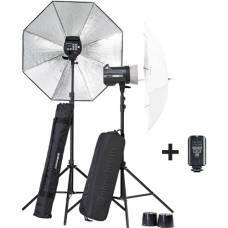 The D-Lite RX One is a simple, easy-to-use studio lighting system. Use this modelling lamp with all Elinchrom studio heads that take user-replaceable modelling lamps. Stay in touch by following us on these social networks. We are currently awaiting stock of this item. Send us your contact details and we'll contact you right away with an update on availability. Please Note: Due to the item being out of stock, we cannot guarantee availability or price. All prices are subject to change without notice. Thank you for showing interest in this product. One of our Sales Consultants will be assigned to your enquiry right away! Thank you for submitting a rental request. One of our Consultants will be assigned to your request in order to verify availability. Get notified on new products, exclusive sales, and more right to your inbox! Please read and agree to our terms below. Outdoorphoto will use the information you provide on this form to be in touch with you and to provide updates and marketing. You can change your mind at any time by clicking the unsubscribe link in the footer of any email you receive from us, or by contacting us at [email protected] We will treat your information with respect. For more information about our privacy practices please visit our website. By clicking below, you agree that we may process your information in accordance with these terms. Thank you for subscribing to the Outdoorphoto Newsletter. To complete your sign up please click the "Confirm" link in the email we've just sent you.